I love adding pictures to the Customer Gallery! 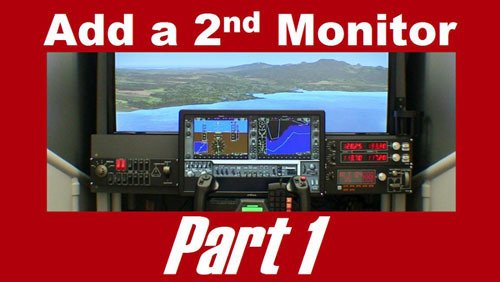 Check out this customer-built DIY Flight Sim Pod that was completed by Russ in North Carolina. He has it set up to simulate general aviation airplanes and regularly uses it for cross-country flights that he posts about on his Facebook fan page. You can see it features a large HDTV as the primary display, an auxiliary monitor for the flight instruments, Saitek switch panels, and the Saitek Pro-Flight yoke/throttle quadrant. Note the trackball mouse. I recommend this handy feature for any flight sim. Rudder pedals! No twisty joysticks for us, we’re pilots. Trim wheel: this is a great product from Saitek that I think is overlooked by way too many people in the flight sim community. 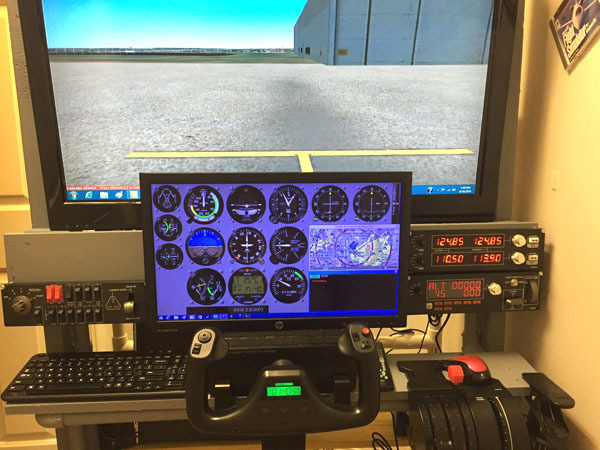 I’m happy to see pictures of a completed DIY Flight Sim Pod. 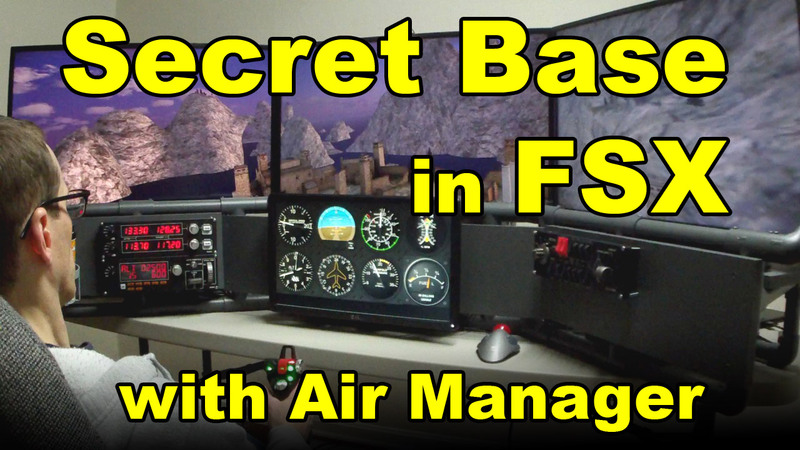 This is one of my favorite projects but after I published it, I started to realize many people probably didn’t have room for a home flight simulator this large. The Pod is about the size of a Smart Car. Russ found a way to work with limited space by leaving off the Pod’s side walls. You can see in his video here that the walls of this room actually serve as the side walls for the flight sim …. smart! You can keep up to date with Russ’s flying adventures by liking his Facebook fan page at this link. 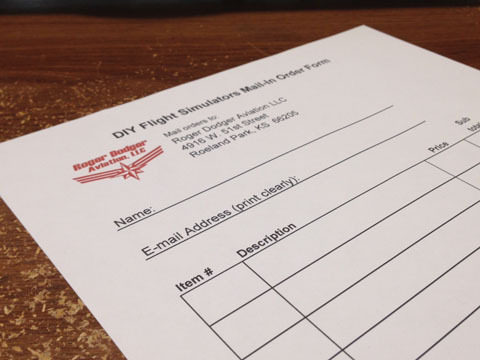 Do you want to order a Roger Dodger Aviation DIY project, but don’t want to order online? You can do that with this handy form you can print, fill out and mail. Include a bank check or money order. If you send a personal check with your order form, I will have to wait for it to clear before I email you the download link. Be sure to include your email address, and please write clearly. I only sell digital videos and manuals, so I will email you a link to your purchase so you can download it. I don’t offer refunds for mail-in orders. Because I have to manually process this order, the regular refund policy doesn’t apply. Fortunately, it is very rare for anyone to request a refund, and I’ve never had a refund request for a mail-in order. As always, I appreciate your business. I unexpectedly adopted a cat when my mom moved to a new apartment and discovered she couldn’t have pets. Then I realized something amazing: I’ve been making YouTube videos for 10 years and I’ve never uploaded a video with a cat. I can now do cat videos! I had dreams of my cat earning enough money in ad revenue to pay for her own food, litter, and vet bills. Look at this video, she even hops onto the back of my chair and flies through space with me…. how cute is that? I guess it’s not that interesting to people. Literally zero people care. So I guess I’ll have to eat her. I’ve spent an enormous amount of effort migrating the essential content from the old website over to this new one. 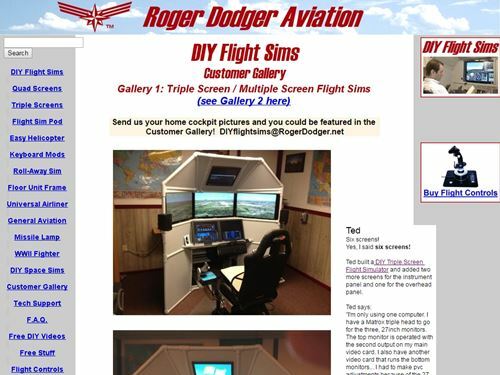 One of the most essential webpages and the part I’m most proud of is the Customer Gallery where so many people sent in pictures of their completed DIY Flight Sims projects. I love getting these pictures! The Customer Gallery is huge and I haven’t moved it yet, and it’s going to be a lot of work. Now that I know a few things about optimizing photos for the web, I will have to adjust every picture from the Customer Gallery so the website won’t bog down. I’m going to have to optimize over 90 photos. But I will do it. I’m grateful for every one of these pictures and every one of these customers. They all put a lot of effort and care into their projects. By the way, you may see other blog posts that have blurry pictures. Those are just sample posts that came with the WordPress template. I’ll delete them soon.